Packed with wholesome veggies and organic cranberries, plus essential vitamins, minerals and taurine to support healthy eyes and a healthy heart. Organic Chicken, Water Sufficient for Processing, Organic Chicken Liver, Organic Pea Protein, Organic Dried Egg Product, Organic Coconut Flour, Organic Flaxseed, Calcium Carbonate, Sodium Phosphate, Salt, Organic Dried Alfalfa Meal, Choline Chloride, Potassium Chloride, Organic Guar Gum, Organic Spinach, Taurine, Minerals (Zinc Amino Acid Complex, Iron Amino Acid Complex, Copper Amino Acid Complex, Manganese Amino Acid Complex, Sodium Selenite, Calcium Iodate), Vitamins (Niacin, Vitamin E Supplement, Vitamin A Supplement, Thiamine Mononitrate, Pyridoxine Hydrochloride, Riboflavin Supplement, d-Calcium Pantothenate, Vitamin D3 Supplement, Biotin, Vitamin B12 Supplement, Folic Acid), Sodium Alginate, Organic Cranberries, Organic Rosemary, Organic Sage, Xanthan Gum. 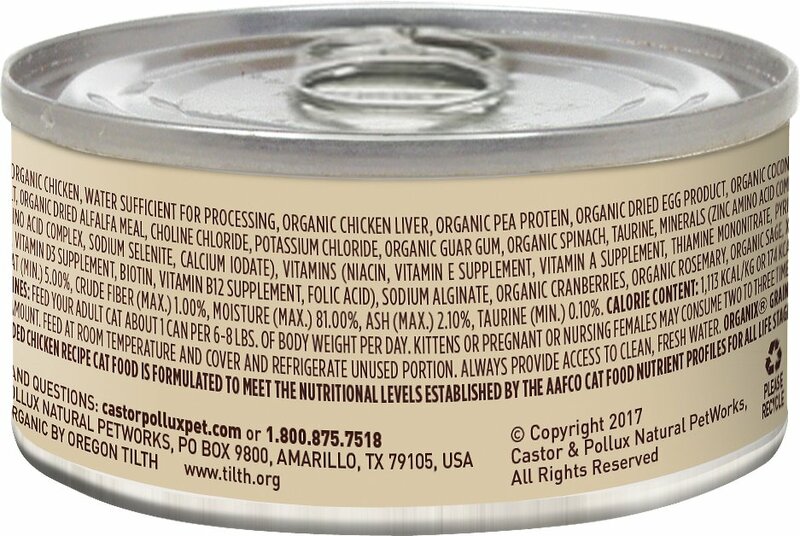 You can lead a cat to food but you can't make them eat it; that is, until now? 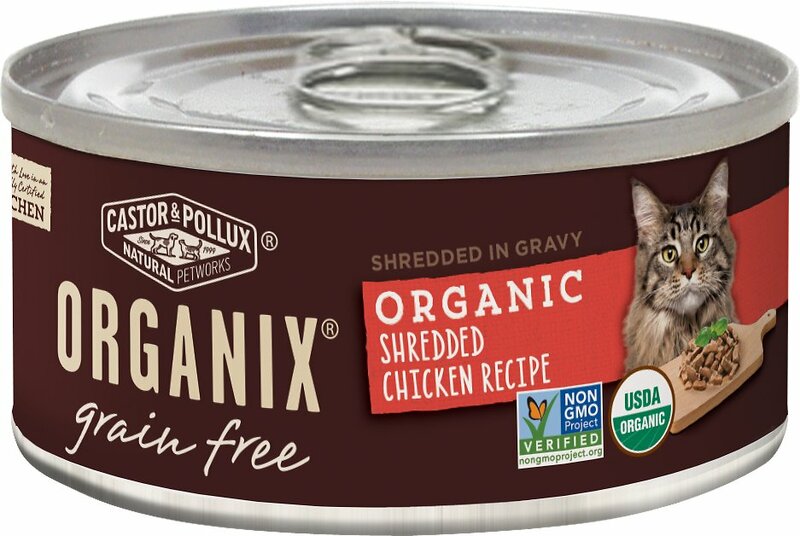 I'm a bit of a health nut and eat everything organic when I can get it, so it should be no surprise that I want my cats to eat organic too. 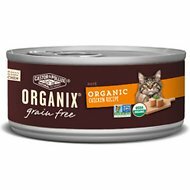 I've been trying to get my cats to eat "Organix" since it first appeared in the market; they just weren't interested, that is, until now. The shredded chicken recipe was just the ticket. My cats love it, and I love that they love it. Will by more and recommend it highly. We bought this at our local pet store to give our cats a chance to try it out. 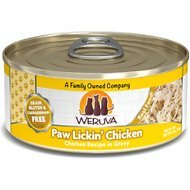 They loved it but when we ordered it through Chewy the cans were watered down and there was a lot less actual food. We'll keep a case on the monthly bulk order to see if it was a fluke since we haven't had issues with any other food we've tried. several cans came nearly empty, and the food consists of a small amount of meat cubes and the rest is a very thin liquid. My cat refuses to eat it. Not sure if this is how it is meant to come, but definitely do not recommend. I wouldn't say this is shredded. It's more like meaty bits with a good amount of broth. Only 1 out of 6 would eat it. Looks good, this one doesn't contain any fish oils. This says it is shredded chicken. But it is not. My cats would not touch it. It looks like the "chicken" was processed in 1/2" wide strips. Nothing in it looks like chicken. Changed. Not for the better!! While it is very important for me to feed organic, this is not the same chicken in gravy I used to buy. This is a watery soup, and I have to feed more than I did before. Very disappointed in what happened to a once perfect cat food. My 2 cats have markedly different tastes in food. One prefers pate style while the other likes saucy foods. This food is largish strips in a lot of gravy. It looks kind of awful, and they were both a bit suspicious at first, but now they are devouring it. Seems to be good ingredients. This food is not in gravy, it's more like a brothe. Only 1 of my cats liked it.